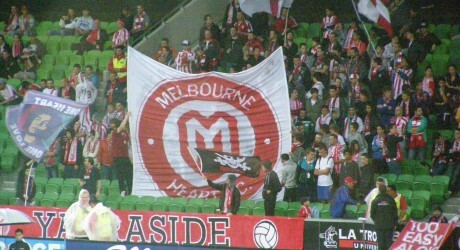 Melbourne Heart fans raise their banner prior to the game with Sydney FC on 27 November 2010. Photo: Roy Hay. Melbourne Heart 0 Sydney FC 0 By Roy Hay Melbourne Heart and Sydney FC drew-nil at AAMI Stadium on Saturday night. With three former Sydney players in the Heart starters it might be expected that the sides might be familiar enough to cancel each other out, but in fact it was a relatively open game whose rhythm was upset by some fussy refereeing. The match report spilled over into two pages to record nine bookings, two of which to Sydney’s Sung-Hwan Byun in stoppage time led to his dismissal. 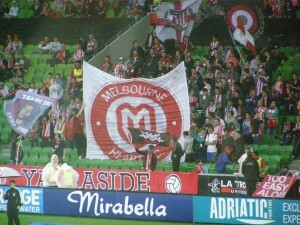 A curious bit of programming by Football Federation Australia had Melbourne Heart play Sydney FC at 8.15 pm on Saturday. It was an atrocious night in the city with severe thunderstorm and flash flooding warnings on all the motorways. Just to compound the reasons for staying at home, the pay TV broadcaster Fox Sports broadcast the Newcastle game against David Beckham and the Los Angeles Galaxy against the Melbourne gate. So it was rather impressive that the match drew 5,183 fans, including a vociferous and committed group of Cove and other Sydney fans. Both sides were short of full strength, but equally neither coach was willing to suggest that the replacements were anything other than first class. Heart began well and created some good openings early on. Josip Skoko was at the centre of three excellent Heart moves in the first fifteen minutes. He put Alex Terra away with a brilliant reverse pass, then released Adrian Zahra down the right only for the young winger to shoot wide and then he had a curling cross-shot of his own which was only just cleared by the Sydney defence.